I'm on a sixth scale roll this week, but it's more than that - it's a Hot Toys Star Wars Rogue One sixth scale roll. And I'll keep it going on Thursday night as well! 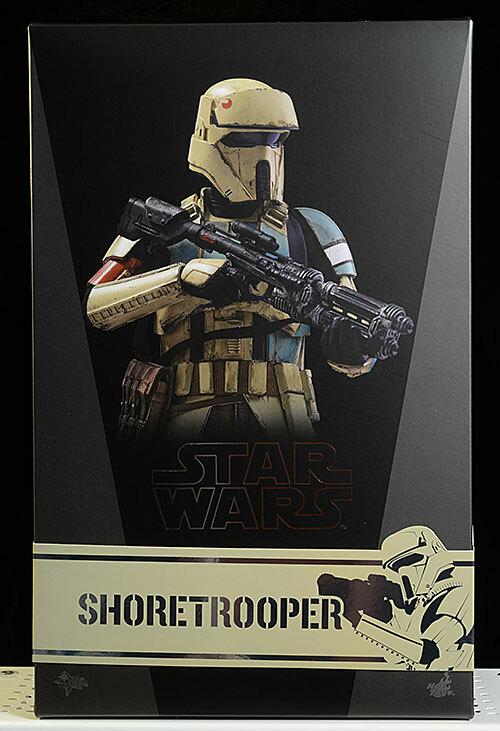 Tonight I'm looking at one of the new Troopers present in the film - the Shoretrooper. These military forces were a special unit trained to patrol the tropical beach regions on planets like Scarif. 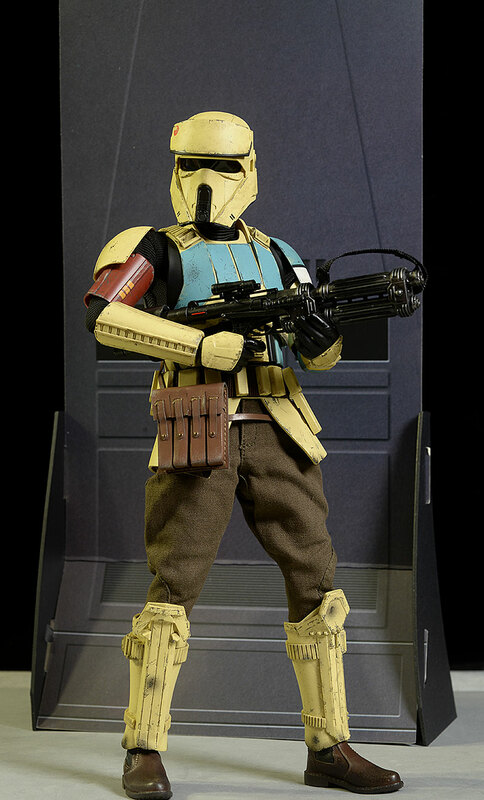 To be a Shoretrooper means you're above the average Stormtrooper, and they are a fairly rare breed. This guy goes one further, as he's a Captain, obvious due to his blue stripes. At least I think they were going for a Captain look - you can never be quite sure when they don't actually label it that way. This guy is on the cheap side for a Hot Toys figure, coming in around $205 depending on the retailer, and he just started shipping. The shoe box style package is pretty basic, but it does have the cigar band name around the cover, and of course there's a cardboard slip cover inside as well. It's all collector friendly, and it was quite easy to remove the figure and accessories with no damage. This is another new design for the film, building off the classic look of the Stormtrooper but going in a slightly less armored direction. 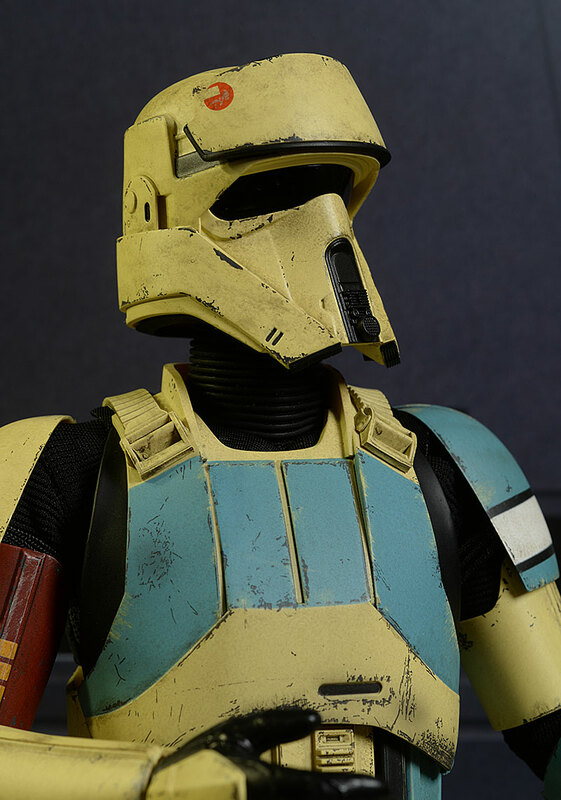 I really like the helmet - it reminds me of a Speederbike helmet, and it manages to convey the feeling of the original films. It would look right at home in ESB or ANH. 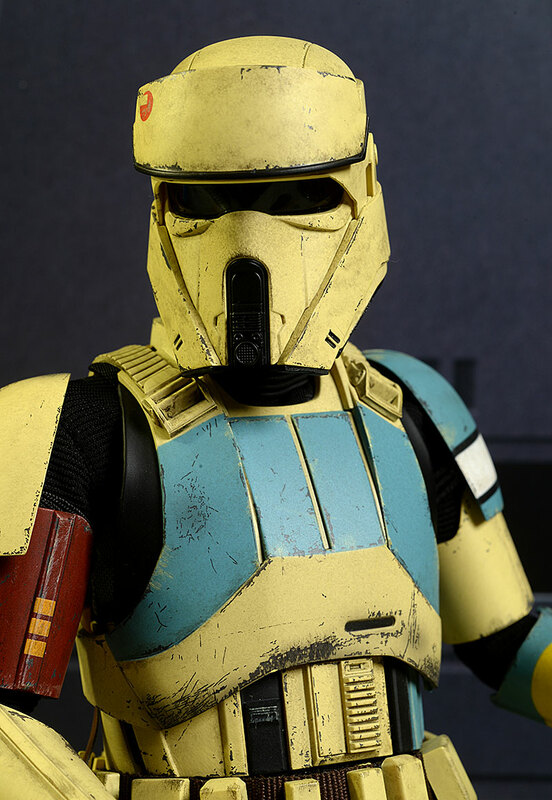 I compared the look of the helmet to the Anovos version, assuming they got it right of course, and the match is quite good. All the small detail work is there, the proportions are relatively good considering the change in scale and the lack of any actual head inside, and the realistic look of the finished product is spot on. There's not a ton of re-use on the body armor, which is always a plus with a new Trooper design. The torso, abdomen, shoulders, vambraces, rerebraces, and greaves all look terrific, with sharp details and clean sculpts. The pieces fit together well, although there is some restriction in the hips. My only complaint around the sculpting on the body is the tiny feet, where the boots seem slightly out of scale with the rest of the figure. He's the usual 12" tall, fitting right in with other figures in this line and others in sixth scale. The armor is a 'sand' color, designed to blend in with the surroundings. There is a bright white band on the one bicep, and of course the chest and one shoulder are blue. But even this blue is the color of sky, fitting right in with the habitat he'd be assigned. There's a lot of weathering on this one too, and it's all quite realistic and appropriate. Rub marks, scratches, and even dirty discoloration are done with precision and accuracy, creating a chaotic look that masks the talent required. He's on a normal TrueType, so there's no real surprises in the number or quality of joints. Everything is here, and the majority of the joints have a very good range of movement. Two stand outs are the neck and the ankles. The head sits up pretty high on the neck, giving you plenty of clearance between the bottom edge of the helmet and the shoulders. That's useful for posing the head in realistic ways, but it can create a giraffe look from certain angles. The other excellent joint is the ankles, where you'll get plenty of rocker and side to side movement. He can easily keep his feet flat on the ground in deeper stances, and the short boots don't get in the way. The ankles are tight too - in fact, all the joints are tight and solid. Unfortunately, there are also two negative areas. The hips tend to have less movement than you'd expect, due to the armor plates that hang down, often called 'faulds' in medieval times. He can still take most standing and walking poses, but deep crouches or sitting poses are going to be nigh impossible. The other issue is with the hands. The small pegs that go into the hands don't hold tightly, and the hands pop off quite easily. This is a bigger issue due to the armored forearms, as these plastic pieces put pressure downward on the hands in many poses. I was replacing them constantly, even when barely adjusting the pose. Considering the price point, he has a decent number, but it's nothing exceptional. 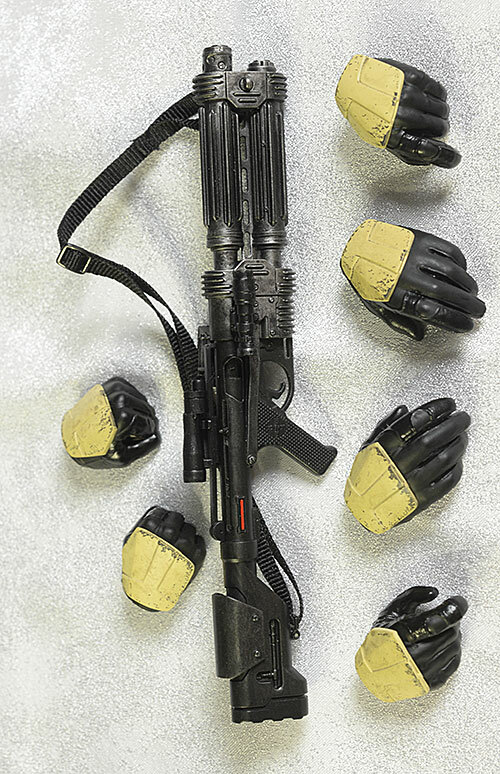 There's several hands of course, including a pair of fists, a pair of gun grips, and a pair of front stock grips. Another gesturing hand or two would have been nice, but it's not a deal breaker. As I said, these tend to pop on and off too easily, and they've included a couple extra wrist pegs just in case. 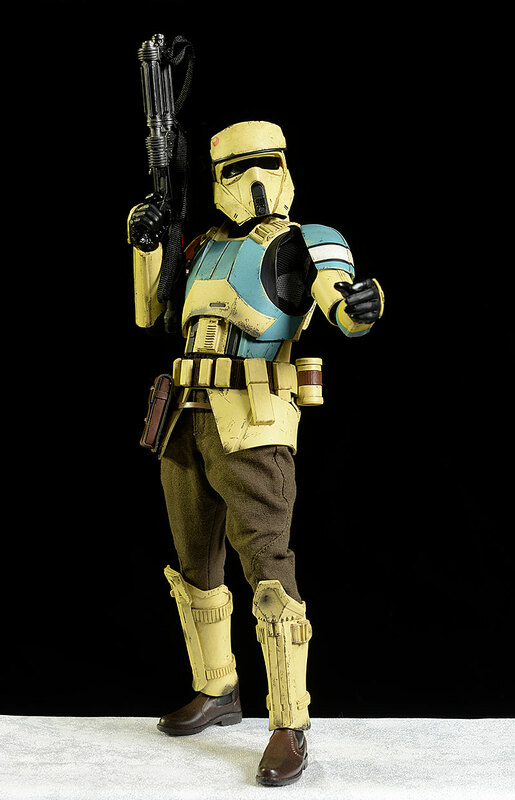 Getting the two sets of opposite gun grip hands is a nice touch, since it allows you to mix up the look with the other predominately right handed Troopers in your collection. 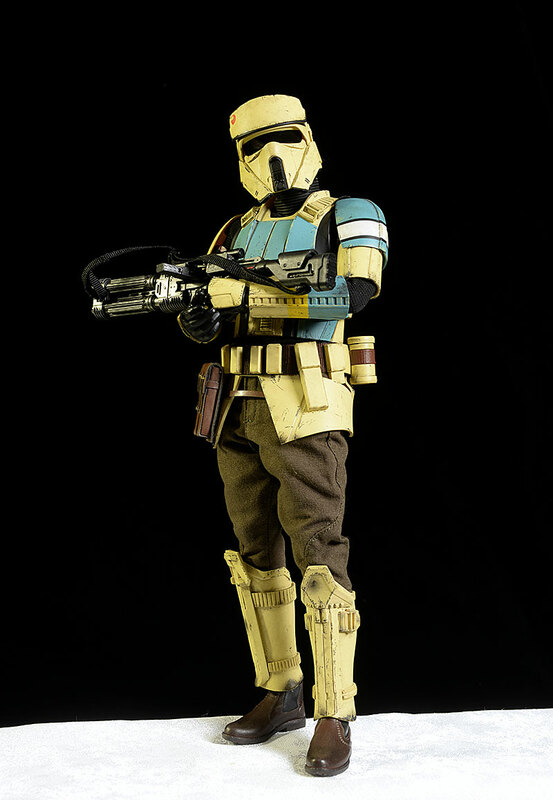 He also has his E-22 blaster, with a shoulder strap to wear it on his back. You'll need to do some adjustment on the strap to get it to hang properly, as right out of the box it's too short. The sculpt and paint work on the rifle itself are excellent, and this is a very cool addition to the arsenal. It's worth noting that *technically* the brown ammo pouch on his right hip is also an accessory, as it's easily removed. It his held in place with Velcro. Of course, removing it leaves him looking a little weird, so I'd stick with keeping it. Like several of the new figures, he comes with a display backer card, which stands upright thanks to two cardboard supports for either side. I included this backer in the LifeSizer photo. 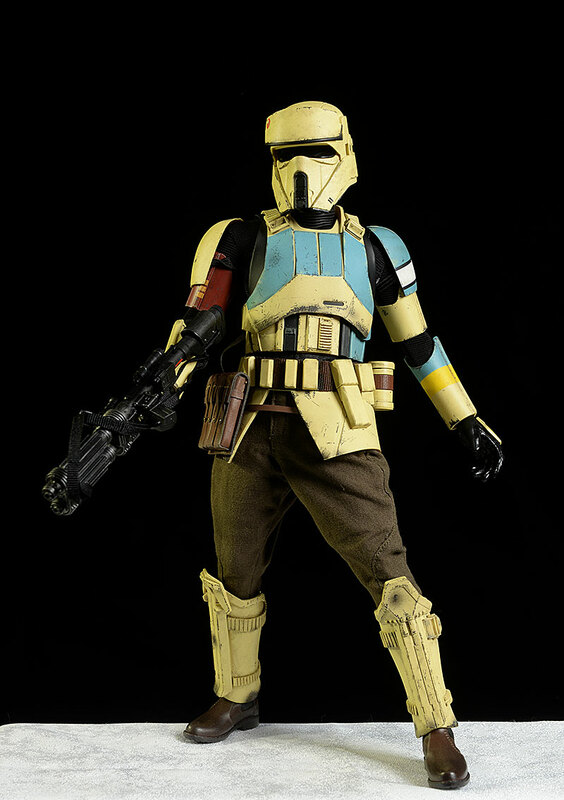 It's actually two sided, with the opposite side showing several rectangular panels of Shoretrooper art, done in a sort of comic book panel style. It doesn't do much for me, since it's simply too small to be effective in any real display. He also has the more recent style of black display stand with the small card with specific artwork and a support rod. It's nice for consistency, but you won't require it to keep him standing. And now I'm glad I didn't, all because of the outfit. I really like the combination of the armor and pants, creating a look that seems all that much more realistic. The overall outfit is a little more breathable (a little), and seems more in line with the tropical setting. The overall fit is terrific too, and as I said before, my only real nit is that the booted feet seem a smidge small, scale-wise, to the rest of the character. It's a minor nit though, and I'm really loving the way this guy looks on the shelf. Posing is pretty easy, particularly when working with more relaxed stances. The fighting stances are a little tougher, thanks to the hip armor and the annoying hands, but you should suffer only minor frustrations. Most Hot Toys figures are going for at least $220 these days, and getting something this cool for around $200 is certainly a solid value. You get the chance to add to the ever growing army, and include one of the more unique new designs. As I said, I almost cancelled this order. 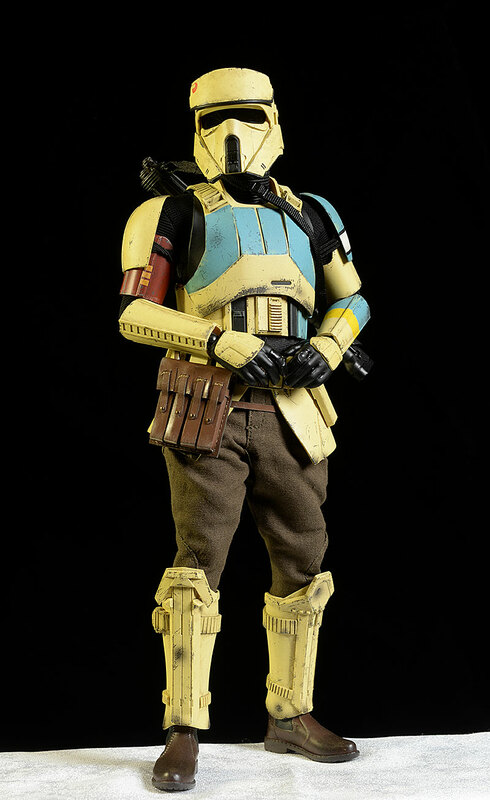 I have a lot of Troopers, from several different companies, and while the Hot Toys releases are always well executed, did I really need another? Turns out I did. This is a terrific looking, unique, and interesting version that will add quite a bit to the display. I'm going to be covering the latest Death Trooper on Thursday night, and I have the same initial worries there - let's see if he passes muster as well. - had him at $205, but looks like they sold out during pre-order. - were at just $195, but also sold out on pre-order. Speaking of Hot Toys Star Wars Rogue One figures, I just covered Chirrut Imwe earlier this week. It was awhile back when I did the Death Trooper Specialist, and before that I had the most recent Darth Vader, as well as the Jedha Patrol Trooper, the Resistance Outfit Rey and the regular Rey with BB-8, a fantastic set. 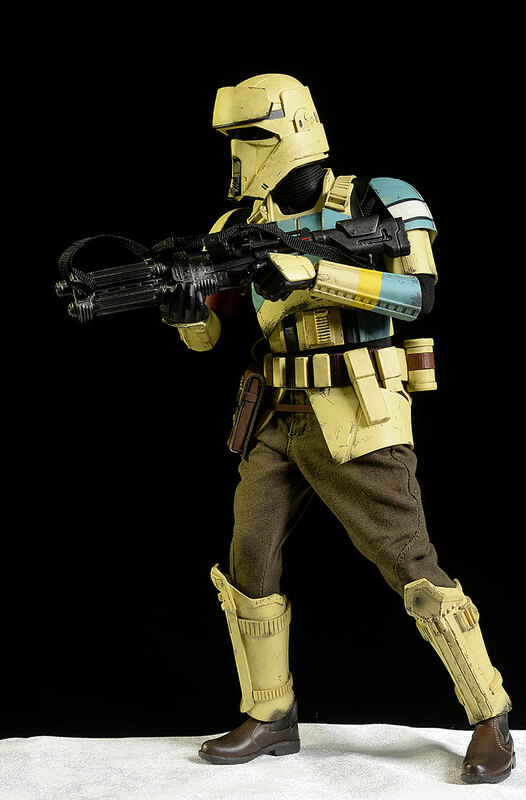 I've covered lots of other Hot Toys Star Wars figures, including the Battlefront Shock Trooper, Finn and Riot Control Trooper, Captain Phasma, the FO Flametrooper, the FO Snowtroopers, and the First Order Shock Trooper, and of course their regular Imperial Stormtroopers. Other Hot Toys Star Wars figures include Kylo Ren, Darth Vader, C-3PO, Tatooine Luke Skywalker, Luke in his Stormtrooper Disguise, Obi-Wan Kenobi, and Han and Chewbacca from ANH. 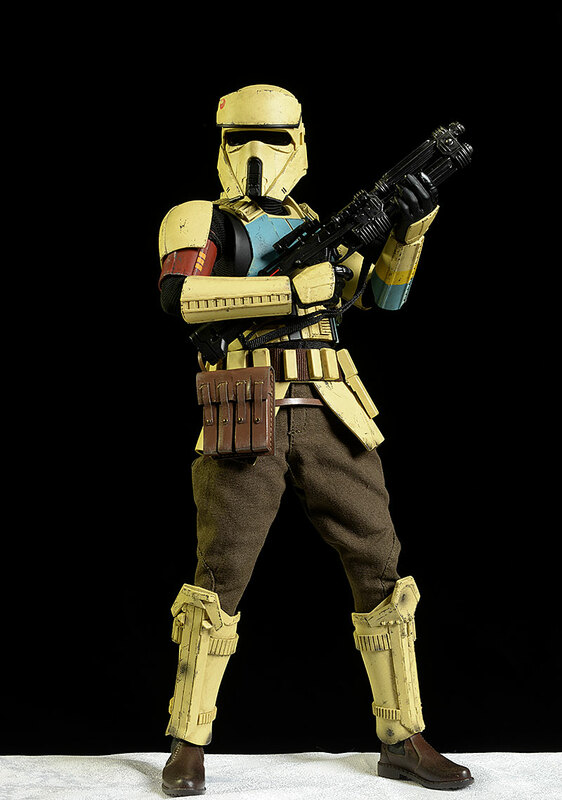 If you'd like a bit more of a regular Shock Trooper, they've done him as well, along with a Blackhole version. This page copyright 2000 - 2017, Michael Crawford. All rights reserved.